Schererville Indiana, because we love what we do. We're not your average computer shop. We come out to you- No need to unplug anything. We offer fast, efficient, quality service, and affordable rates. Hey neighbors, thanks for stopping by. We are #1 when it comes to Schererville, Indiana computer repair. Computer Repair Schererville, Indiana 46375. 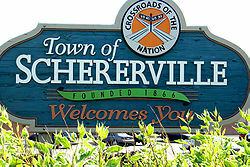 We proudly support Schererville Indiana. Schererville Indiana residents can now receive quality, on-site and in home services from Manley Computers.